Rotherham United and Scunthorpe United start this evenings game level after a two-all draw at Glanford Park on Saturday. The Iron come to the New York Stadium on a good run of nine games without defeat, with their last away defeat being in January at Southend. The Millers last loss at home was a strange one in mid-March when Rochdale won at the New York Stadium by a single goal. 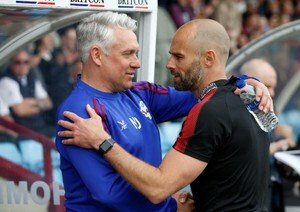 Rotherham United Manager Paul Warne says that although Scunthorpe Manager Nick Daws is one of the best footballers he’s ever played with and a really good bloke, he wants the Millers to get to Wembley and take on another former team mate, Paul Hurst. The Millers will be keeping an eye on Joe Mattock, Michael Ihiekwe, Jon Taylor and Joe Newell who picked up knocks on Saturday, with Taylor coming off during the second half with a dead leg. Scunthorpe Manager Nick Daws told their Official Site that the Iron supporters will give as good as they get tonight and we hope to give them something to cheer about and to stay behind for at the end of the game. Scunthorpe will be hoping that goalkeeper Matt Gilks is fit after a freak accident when he went to throw the ball out and landed on his knee saw him have to be replaced just after the hour mark. But Nick Daws has no other injury worries. The Referee tonight is Scott Duncan from Northumberland and he is aided by Rob Merchant and Mark Dwyer running the line. The Fourth Official is Keith Stroud from Hampshire.